ESPN’s Clemson vs. Texas A&M Leads the Way: 3.0 Overnight, the Top Game of Week 2 Across All Networks; ESPN/ABC Win the Day with Four of Top Six Games Overall - ESPN Press Room U.S.
With one of the most dramatic finishes in the 2018 season, ESPN’s presentation of Clemson vs. Texas A&M was the highest-rated game of Week 2 across all networks. The tightly contested matchup between the Tigers and the Aggies is the second-highest Saturday primetime game on ESPN since 2016, and was up +50% from the same game window in 2017, which saw an early-season showdown between No. 3 Clemson and No. 13 Auburn go Clemson’s way with the Tigers scoring 14 unanswered points to beat Auburn, 14-6. With the contest coming down to the closing minutes, the action at Kyle Field peaked at a 4.0 (10:30-10:45 p.m. ET) as Clemson intercepted the ball on an attempted A&M two-point conversion to seal the victory for the Tigers, 28-26. In addition to ESPN’s marquee matchup between Clemson and A&M, ESPN and ABC teamed up to televise four of the top six games Saturday. Colorado’s 33-28 victory over Nebraska (3:30 p.m., ABC) rated a 2.1 Saturday, while Penn State’s rout of in-state rival Pittsburgh (8 p.m., ABC) registered a 2.0 rating. The noontime reverse mirror games of Arizona vs. Houston and Georgia Tech vs. USF recorded a 1.9 rating. With a wild finish that came down to a 28-yard field goal as time expired, Arizona State’s 16-13 upset of No. 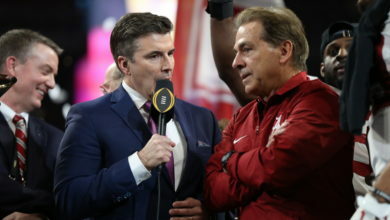 15 Michigan State (10:45 p.m., ESPN) averaged a 1.6, the highest for that window on ESPN since November 2016 and 100% ratings increase from 2017. In total, ESPN touted the top five games on cable Saturday.